A few weeks ago, I went for a celebratory dinner with some friends to The Providores and Tapa Room on Marylebone High Street, where they serve all of their dishes in taster portions, and the style of food is an unexpected East-West fusion. It had been a beautiful day, with the perfect kind of London-y atmosphere that you feel when you meet up in the Spring sunshine with a big group of friends, and wander through narrow streets of Edwardian terraced houses until you find some funky pub full of knick-knacks to kill an afternoon in. We were all in good spirits, and by the time we made it to the restaurant, everyone was a little tipsy and a lot hungry. The dish I remember most from the menu was a smoked duck, tamarind, licorice, and coconut laska with green tea noodles and a soft-boiled quail's egg. I just had to order it, for no other reason than to try tamarind and licorice together with duck. It was irrelevant that I didn't know what a laska was. I've been thinking of laska ever since. I can't figure out how I've never encountered it before- spicy coconutty broth with noodles and the meat-y topping of your choice? Sounds like the perfect way to bring a little bit of spice (and the memory of a wonderful day) into an ordinary weekday dinner. Start by making a paste. If you've got a good mortar and pestle, bash together the chili, garlic, ginger, coriander seed, fresh coriander, and sesame oil until it's a pulp. Otherwise you could use a small food processor, or if like me you don't want to make extra washing up, you could just chop everything together by hand as finely as possible. Fry the paste on a meduim heat until it is smelling great, then add the coconut milk and stock, and let it bubble away for a few minutes to reduce down. Add the fish sauce, and then try your broth. If it doesn't taste salty enough, add a little more fish sauce. In the meantime, put your noodles into boiling water according to the pack instructions, around 5 or 6 minutes. Your cabbage can go into the coconut broth now, and then just about 2 minutes before the end, throw the prawns into the coconut mix as well. Turn off the heat and then stir in the lime juice. 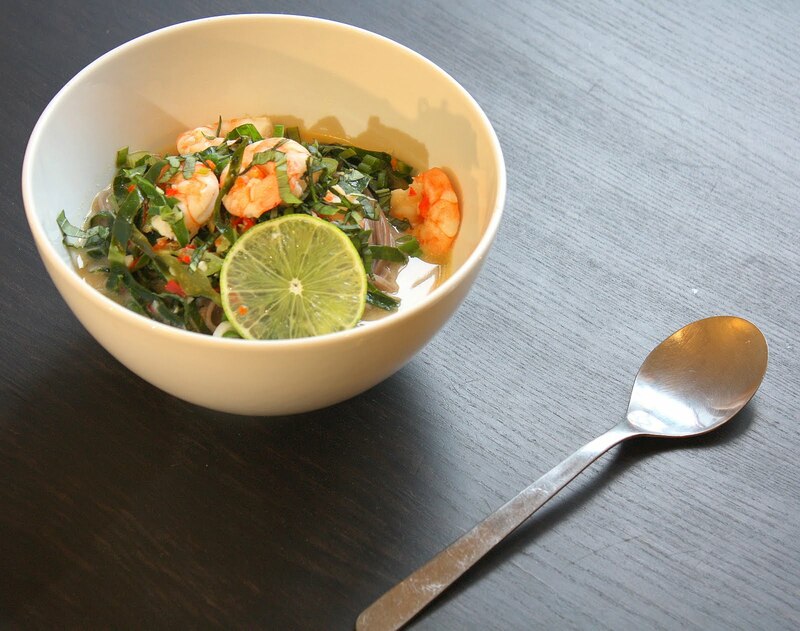 Drain your noodles and place them in the bottom of two bowls, then ladle the coconut, prawns, and veggies over the top. Garnish with a handful of chopped spring onion and finely sliced fresh basil, and serve with lime wedges.